TEDxSydney 2016 speaker, Clara Vuletich speaks about her work in the sustainable fashion space and what happens when we throw away our clothes – particularly when it ends up in landfill. Clara works with some of the biggest brands in the world and helps them ask the right questions about where the clothes that we wear come from. 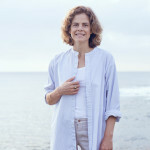 She is interviewed by TedxSydney Head of Curation, Fenella Kernebone. Clara Vuletich is a designer, researcher, educator and consultant who has worked in the sustainable fashion space in UK and Europe for ten years, and is now based in Sydney, Australia. She was part of the team at the University of the Arts London who designed The TEN, a pioneering sustainable design methodology used by brands including H & M; VF. Corp. and Gucci Group. Clara has recently established a consultancy business that utilises The TEN framework to equip Australian fashion companies with training and insight on sustainable product innovation and strategy.